On June 17, 2013, Astronaut Chris Cassidy successfully drove a K10 rover on earth, via remote connection from the Surface Telerobotics Workbench on the International Space Station, showing that robots deployed to explore Mars or the far side of the moon could be remotely controlled by astronauts in space during future deep-space missions. Telerobotics, which involves human operators remotely controlling robotic arms, rovers and other devices in space, is one means of reducing risk in dull, dangerous or dirty tasks as humans explore space. Photo credit: NASA. 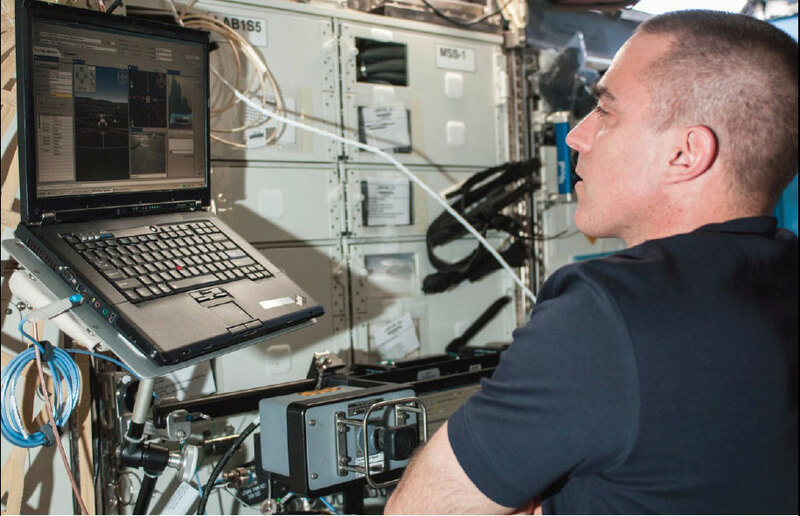 Chris Cassidy studies the Surface Telerobotics Workbench on the International Space Station to remotely operate the K10 rover on Earth at NASA’s Ames Research Center in Moffett Field, Calif., in June 2013. Photo credit: Dominick Hart/NASA. 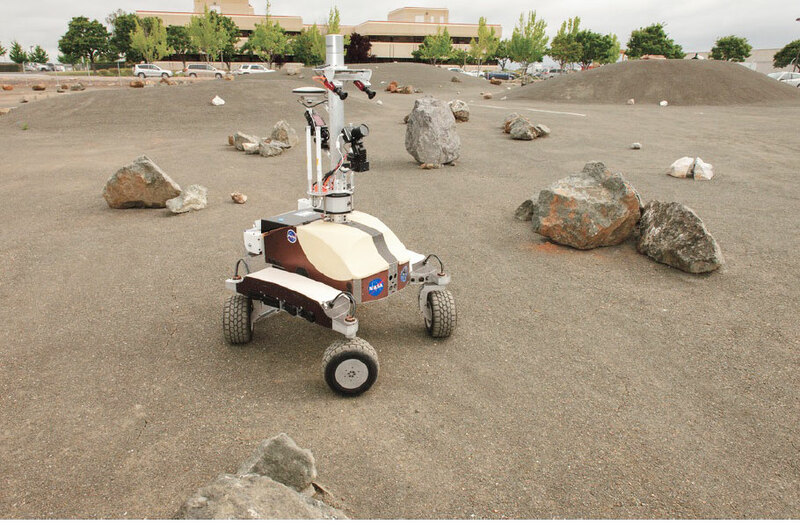 NASA’s K10 rover at the Ames Research Center in Moffett Field, California performs a surface survey with its cameras and laser system, and then deployed a simulated polymide antenna while being controlled by an astronaut in space during a June 2013 test. To characterize telerobot utilization, operator workload and operator situation awareness. Surface Telerobotics is intended to reduce risk for future human-robot exploration missions, identify technical gaps, and refine key system requirements. Lunar Farside: Astronauts orbiting the Moon (or station-keeping at the Earth-Moon “L2” Lagrange point) remotely operate a surface robot exploring the lunar farside. Astronauts would take advantage of low-latency (less than 250 ms) and high-availability communications to maximize robot utilization during a short-duration mission. Near-Earth Object (NEO): Astronauts approaching, in orbit, or departing a NEO (e.g., asteroid) remotely operate a robot landed on surface. Astronauts would control the robot from the flight vehicle because the NEO environment (high rotation rate, rapidly varying illumination, etc.) rules out remote operations from Earth. Mars Orbit: Astronauts in aerostationary orbit around Mars (or perhaps landed on Phobos or Deimos) remotely operate a surface robot exploring Mars. Astronauts would control the robot from the flight vehicle when circumstances (time-critical activities, contingency handling, etc.) do not permit remote operation from Earth. If successful, this project will help NASA better understand the key issues, engineering requirements, and costs/benefits associated with crew-centric surface telerobotics. In addition, data collected by the test will inform the design of future ground-based tests, particularly in terms of the key factors that need to be simulated at high levels of fidelity. Finally, this project will help confirm (or reject) many of the assumptions and hypotheses that have been made by numerous space exploration study teams regarding the technology maturity, technology gaps, and risks (operational and functional) associated with crew-controlled surface telerobotics.